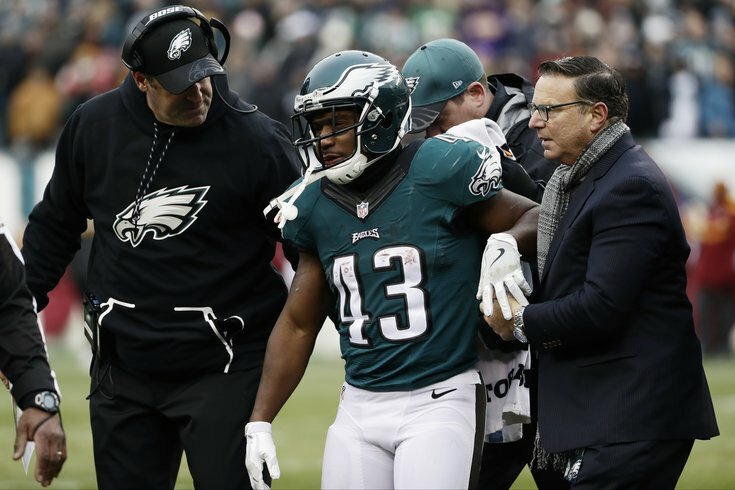 Darren Sproles will sit out the Eagles' game vs. the Ravens, while the player who hit him with a cheap shot will continue to play. If you're an Eagles fan, the injury report is really only meaningful at this point in the season if you own Darren Sproles in your fantasy football league. Still, here's the Eagles' and Ravens' injury report, with analysis. • RB Darren Sproles: Sproles is still in the concussion protocol after being the victim of a dirty hit by Redskins safety Deshazor Everett a week ago. Should Eagles put in a waiver claim on Michael Floyd? • OT Halapoulivaati Vaitai: With Vaitai out, Allen Barbre slid over to RT the last two weeks, with Stefen Wisniewski filling in at LG. However, Barbre may be out as well this week, putting the Eagles' offensive line in even more disarray. • OG Allen Barbre: Barbre is a game-time decision with a hamstring injury. If he cannot play, Doug Pederson said that rookie Isaac Seumalo will start at RT. • TE Brent Celek: Celek remains the Eagles' best blocking tight end, which they may need with so many offensive linemen out. • WR Dorial Green-Beckham: DGB is expected to play. • LB Kamu Grugier-Hill: Special teams contributor only. • WR Jordan Matthews: Matthews is obviously the Eagles' best receiver, but he has to make the plays that he should make, like the missed opportunity for a touchdown last Sunday against Washington. • RT Lane Johnson (suspended 10 games): Eight games down on Johnson's suspension, two to go. • CB Ron Brooks (IR): As a player, Brooks isn't exactly a world-beater, as he doesn't have a single interception, sack, or forced fumble over his five-year NFL career, however, his loss has forced Malcolm Jenkins to drop down into the slot in nickel packages, with Jaylen Watkins coming off the bench to play safety. • RB Wendell Smallwood (IR): Smallwood suffered a sprained MCL against the Redskins. With Sproles and Smallwood both out, Ryan Mathews will start, with Kenjon Barner and recent elevated Byron Marshall getting additional action. • LS Jon Dorenbos (IR): The Eagles signed Rick Lovato to take Dorenbos' place. • OL Matt Tobin (IR): Tobin was injured against the Redskins on the play before allowing the game-sealing sack-fumble by Ryan Kerrigan against the Redskins. • CB Jimmy Smith: Smith is arguably the Ravens' best corner. If only the Eagles had receivers who could capitalize on that. • CB Jerraud Powers: See above comment about Eagles receivers not capitalizing on banged-up corners. • TE Crockett Gillmore: Minor contributor. Eight catches for 71 yards and 1 TD this season. • OG Alex Lewis: Rookie fourth-round pick has started eight games for the Ravens this season. • S Anthony Levine: 11 tackles this season.